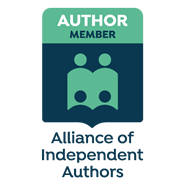 Author of contemporary urban thrillers, freelance editor, mentor and creative writing tutor. The 9th Festival of Writing in York, and the first under the banner of Jericho Writers - formerly Writers' Workshop - passed in the usual blur of activity, creativity and enthusiasm. As a result, I have a tsunami of work to catch up on so this post is going to rely on pictures to convey a flavour of the weekend in which lives were changed. Helen Kampfner, self-edit graduate and winner of Friday Night Live! 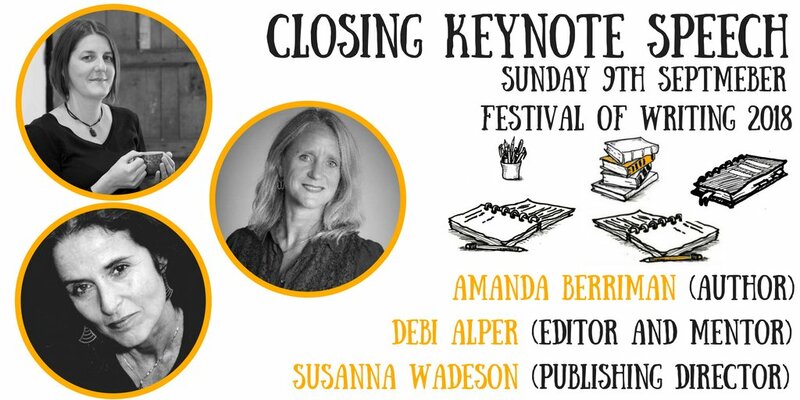 The closing keynote speakers: Susanna Wadeson, publishing director at Transworld, and Mandy Berriman, author of Home - and my mentee! The story behind the stories: 256 anonymised submissions, all on the theme of 'Home'. 55 stories chosen (with great difficulty!) for the anthology. Another 29 published free on our website. ... I'm more than delighted to share the news that the paperback launch for Stories for Homes 2 is TODAY! See an interview I did with Retreat West here. Check out our forthcoming events here. And, in case you need any persuasion, this is why we're committed to doing something about the housing crisis. * According to Shelter, 65,000 families will be homeless this Christmas. * At least one more family becomes homeless in Britain EVERY TEN MINUTES. * There are 250,000 homeless people in England. That's a quarter of a million! * In the worst hit areas, 1 in 25 people are homeless. * Last year, the lowest number of socially rented homes were built in 71 years. 71 YEARS! * Tory austerity is linked to 120,000 deaths, according to a study in BMJ Open (medical journal). The devastating tragedy of Grenfell Tower should never have happened. That's why we dedicated this book to the victims and survivors of the Grenfell fire. SfH1 raised over £3000 for Shelter. This is a photo from our previous launch. We eventually doubled the figure in that dummy cheque! You can still buy the first anthology here. Read more about the project here, in a blog by the wonderful Jel, who has been doing sterling work with promoting the anthology. The gorgeous cover was designed by Head and Heart, featuring an original artwork by my co-editor, Sally Swingewood. As before, all this has only been possible thanks to our fabulous team of volunteers. Their unpaid hard work means that every penny raised goes direct to Shelter. Access to a safe and secure home is a human right – one that thousands of people are denied in 21st century Britain. This world class anthology is a good deed in a very naughty world. Thanks so much for your support. Together, we can make a difference. Another brilliant year in York for the 8th Festival of Writing and I now have the distinction and pleasure of being one of only three people who have been to every single one. ... I devised a new workshop this year. The idea for Facing the Fear came as a result of the responses to this blog post, where I had a conversation with the Doubt Demons. This photo is of people struggling to find the love for themselves. And in this one, they're sharing that love with each other. Tha gala dinner rocked, as ever. 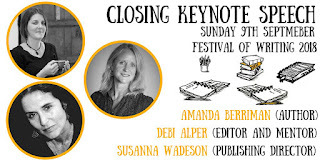 This will be the last year in which Mandy Berriman, my wonderful friend and mentee, is at the festie as an unpublished author. Her stunning novel, Home, will be published next February and I couldn't be more delighted and excited. John Taylor and I are two of the three people who have been to every FoW. Massive congratulations to Sophie Snell, who won Friday Night Live, and Ruby Speechley, who won the Opening Chapter competition, as well as being runner up for Pitch Perfect. That's Ruby at the mike, with agent Sallyanne Sweeney, who judged the Opening Chapter comp, on the left. And here's the traditional photo of Emma Darwin and yours truly, with our self-edit alumni who had made it to York. We keep adding new names to our Hall of Fame. Details of the next online self-edit courses will be appearing here. While I'm here (and we all know how scarce I am on my blog these days) I want to talk briefly about Stories for Homes. Remember the amazing success we had last time, when we published our world-class anthology and raised over £3000 for Shelter? Well, we're doing it all again and this time the book is dedicated to the victims and survivors of the Grenfell Tower fire. I'm sure no one here needs to be reminded of how acute the housing crisis is in the UK and the causes of the tragedy, as well as the response since, highlight just how appalling life is for the most vulnerable people in our society. The fire happened three months ago and, at this point, there are still no firm figures for the number of people who died ('about 80') and only two families have been permanently re-housed. This time, Sally Swingewood and I received 256 submissions for the anthology, which we had to whittle down to 55. Damn, but that was hard. So hard, in fact, we decided to also publish an online anthology, where people can read free stories on the theme of 'home'. The website has been spruced up, with tabs for Real Life stories and posts by a professional who works with homeless people, as well as the online stories and a donate button that goes direct to Shelter. Once again, producing an anthology at this standard has only been possible thanks to our wonderful SfH community, who have generously given their time and skills to create a world-class anthology. The e-book is due to be launched on 28 September, with the paperback following in November. This is when we'll start to make serious money for Shelter. Please keep an eye on the news tab on the site. Meanwhile, we want to spread the word and get the hashtag #SfH2 trending. Please help us to make that happen by supporting our Thunderclap, as well as publicising (and buying!) the anthology. Towards the end of last year, a Bad Thing happened to me and my family. It wasn't a Very, Very Bad Thing - no one died, we didn't lose our home or our income but, nevertheless, it was a Thing that caused us great pain and stress, and it rocked our faith in human nature. I'm not going to go into detail here about the Thing, though I intend to at some point in order to warn others. The Thing was very negative and this post is the opposite of that. I won't allow it to taint this space. I don't like spreading negativity - there's more than enough of it online and in the real world - and so I haven't said anything in public about the Bad Thing before now. Only those closest to me knew about it. How right I was, though I never expected the answer to come so soon and I could never, in my wildest dreams, have anticipated the form it would take. Without my knowledge, those few people who knew about the Thing - some of whom had never met each other - got together to start thinking about ways they could turn the Bad Thing around, support us in a practical way and, most importantly, restore our faith in human nature. They came up with an audacious plan to start a Crowdfunding campaign. Knowing me as they do, they agreed it was vital to keep the plan a secret from me because I would have vetoed it. Not because I'd be ungrateful (how could I possibly be?) but because the very idea would make me squirm with discomfort. By the time I knew it was happening, donations were well into four figures. I sat staring at my laptop, struggling to breathe, trying to process what I was seeing. What had me gasping for breath the most was not so much the gob-smacking amount that had been raised but the comments people had left. I was reading the sorts of things usually said about someone after they've died, when everyone says what a shame it is that they never knew people cared so much for them. And here I was, alive and very much kicking, the recipient of an outpouring of love and generosity that knocked me sideways. I was way beyond my comfort zone and had no idea how I was supposed to be, or act, or even feel. Words - the raw material of my trade - escaped me or took refuge in cliché. The only way I could cope was to pretend it wasn't happening. I asked the inner circle to pass on a request not to link to me, while worrying that it might look like I was taking it all for granted. But the one thing I was certain about was that it was really important for me not to appear in any way as if I was soliciting on my own behalf. By the end of the campaign, 171 people had donated, leaving comments that made my eyes stream and my heart soar. (See? Not possible without resorting to clichés.) Many chose to be anonymous and I will never know who they - you - are. I wanted to contact everyone and thank them personally but it felt somehow wrong when there were so many I can't identify. here to each and every one of you. Please imagine me looking into your eyes and holding your hands and telling you how you have touched my heart. I hope that everyone this applies to will see this at some point. One person was responsible for the Bad Thing. 171 of you have counter-balanced that negativity with a tidal wave of love. If life is all about making a difference, then you all win at life. And I win because I know all of you. I think it's appropriate to end by quoting my dad. I once remarked when out with him that he always chatted with everyone he encountered: in shops, banks, on the street. 'I like to think that when I meet someone, they go away feeling a little better than before,' he replied. Thank you all for being like Daddy Alper. This has been quite the year, hasn't it. For so many people, it's been filled with shock and grief on a national and international scale and I have to admit I've had some tricky personal challenges too. But there have also been things to celebrate and that's what I'm trying to focus on. I ran 4 more online Self-Edit Your Novel courses, together with Emma Darwin, taking the total to 21 courses and 239 alumni. The Hall of Fame for our graduates is getting crowded. I started singing in a choir (video here) and discovered a love for mudlarking, inspired by this wonderful woman. In the face of the housing crisis, Sally Swingewood and I decided it was time to create another Stories for Homes anthology. (The last one raised mucho dosho for Shelter, as well as being the launchpad for several authors who have gone on to achieve great things.) Details of how to submit are here. Join our community on Facebook, where you can find out all the ways you can get involved. On Mayday, I published De Nada Nirvana - my first new (though written over a decade ago) novel to be available to readers since 2005. And on 20 December, Me, John and a Bomb exploded onto the scene. This novel was written in 2004-5 - a time when chequebooks and cards were still a thing, it was announced in July that London had won the 2012 Olympic bid and, the following day, the city reeled under devastating terrorist attacks. What goes around, comes around and the issues are still very relevant. No one needs me to tell them about the ongoing terrorist threat. 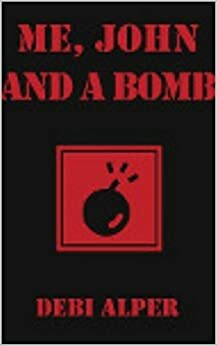 And, in one of those strange bits of writer-ly synchronicity, the day before Me, John and a Bomb was published, I saw a piece on the news about a cop who infiltrated the anarchist network in Cardiff 10 years ago - the central plot thread of my novel. We all know Amazon rankings are pretty much meaningless, but I had a little frisson when I saw Me, John and a Bomb had shot up higher than Nirvana Bites and Trading Tatiana ever did when they were published by Orion. Of course, that was pre-FB and Twitter. Still worth a small squee, I reckon. You can see excerpts from all my Nirvana novels on my website. Next year, I hope to publish The Gene Pool, the 5th and final book in the series. Wishing you all the very best for 2017 and hoping for some sweetness and light in a world that often seems filled with darkness. I did feel a huge sense of trepidation on Friday when I was driving up to York. My inner monologue kept asking me what on earth I was doing! By total contrast, I listened to Jo Cannon's heartwarming story yesterday and felt a real sense that I belonged there. I really didn't want to leave! But I have come away with a wealth of information and tips to apply to my writing, and am looking forward to getting stuck in. For me, it was my busiest festie yet - and that's saying something. I ran the self-edit mini course on Friday and was also on the panel for the wonderful Friday Night Live experience. Massive congrats to all the shortlisted authors and the joint winners, Gerry Fenge and Jo Bunt. On Saturday, I had two hours of Book Doctor slots, a workshop on psychic distance and I did the compering for the Saturday competitions after the gala dinner. Congrats to everyone who had cause to celebrate. The real high was being on the crime genre panel as an author rather than an editor or tutor. And on Sunday, I had another hour of Book Doctoring, a final workshop on dialogue and - oh bliss - I had the privilege and enormous pleasure of being the person who introduced the final keynote speaker and FoW success story, Joanna Cannon. Self-edit mini course. Interesting body language when people are forced to write about an emotionally charged episode from their own past. Who could ask for a more beautiful setting? Every line is bursting with wit handled with the lightest touch, and I can't stop chuckling. The characterisation is very clever and your observations hilarious. Every time you introduce someone they become my new favourite... The list is growing. My cockles are warmed to boiling point. As in previous years, lives will have changed over this weekend. Whether or not people end up being signed by agents, everyone should go away with new tools to apply to their writing. FoW is magical and I wish everyone the very best for the journey ahead. See you online - if you haven't already joined the Cloud, what are you waiting for? - and, hopefully, at FoW17.